Today we’ll be speaking about art, engineering and freedom with two robot-artists building gigantic robots. Our first guest is Theo Jansen, a physics major turned artist out of the Netherlands, about his walking beach creatures and how artists perceive robotics and build sculptures that can walk and sense their environments in a very different way than the robots we are used to. We then speak to Jaimie Mantzel who is an inventor in Vermont. Throughout his life, he’s been literally building his dreams with his own two hands, be it a home in the mountains or a giant 6-legged robot he plans to use to take him around. 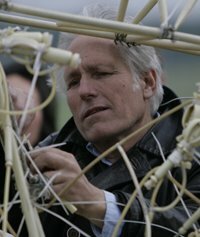 Theo Jansen is a “kinetic artist” best known for his Strandbeest, or beach animals, a new form of life that he is creating out of plastic yellow tubes. From their humble beginning as simple walking creatures with an ingenious leg system, Jansen has added an energy storage system made of plastic bottles, stakes that are hammered into the ground to protect them from the wind, and rudimentary water level sensors to protect the beach creatures from the sea. Jansen’s ultimate goal is to release his creations into the wild, to have them roam the beaches of his native Netherlands in herds and lead their own type of mechanical lives. Jaimie Mantzel’s adventures about building a giant 6-legged robot have been followed by the thousands on his website and youtube channel. He’s been building since he was a child, bringing his wildest inventions and dreams to life. Inspired by his talent, Mantzel started engineering at Brown University only to discover that math and physics were the rule rather than putting parts together. Instead of engineering, he diverted to art and unleashed his creativity. After university and years of work, he pursued his original vocation, building things. As a first step, he bought a piece of mountain in Vermont, USA and built a 4 story dome, his home. However, making small robots, and homes wasn’t enough and Mantzel is now building a giant spider-like robot which he can ride. Building this robot however seems to be a recursive process, since it requires building a workshop, which in turn brought him to dig a road. With all this finished, the robot is now 80% complete with an estimated finalization this summer. However, this interview is not only about making robots, but rather a different philosophy of life, freedom and art. Visit the Robots Forum for background information on this week’s news, including Pleo’s extinction, new inductees into CMU’s Robot Hall of Fame and the flying robot sniper system!